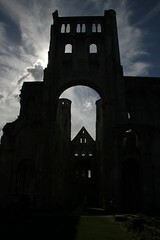 The remains of the Romanesque Abbaye de Jumièges are amongst the most beautiful ruins in all of France. It is fine day-trip from Rouen in Normandy. 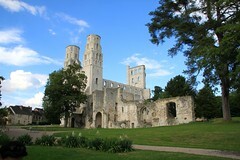 The ruins of the former Benedictine Abbey of Jumièges in Seine-Maritime in Upper Normandy are considered by many to be the finest ruins in France. 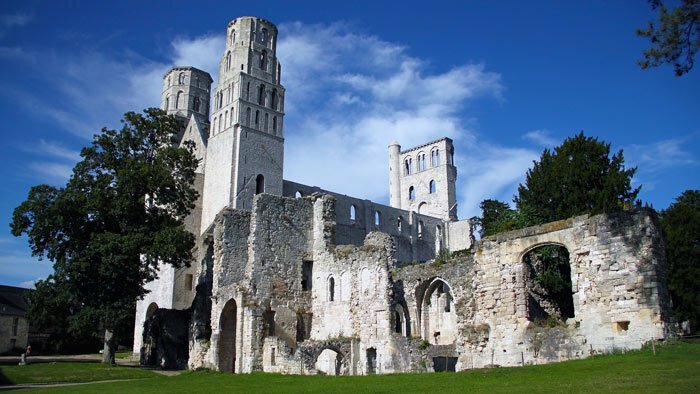 This enormous Romanesque abbey was constructed during the lifetime of William the Conqueror but was mostly destroyed after the French Revolution when much of the church and adjacent buildings were used like a quarry. The western façade with twin towers, the nave, and small parts of the transept, lantern tower and choir survived. Jumièges – a Michelin three-stars sight – is beautifully located a short drive from Rouen. A nearby Christofle factory outlet store sells high-quality silverware at reduced prices. The Benedictine Abbey of Jumièges was founded in 654 on crown lands by Saint Philibert. 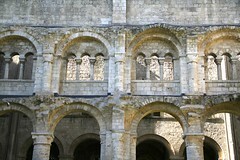 Through its history the abbey often enjoyed royal support. Abbots where often close to the ruling families, which allowed Charlemagne, for example, to exile Duke Tassilo III here after the Franks defeated the Bavarians. Jumièges has a beautiful location on the inside off one of the number of large S-bends that the Seine River makes while meandering between Rouen and the Atlantic Ocean. This lovely location contributed to the abbeys problems: it was highly visible from the Seine River and as a result Jumièges was raided and the Carolingian monastery complex destroyed in 841 by the Vikings. 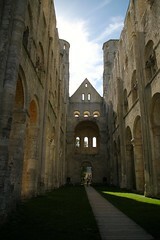 Jumièges was one of the largest monasteries in France prior to the wars of religion in the 16th century. During the Middle Ages it was particularly known for the books produced in the scriptorium. The abbey was raided by the Huguenots during the wars of religion and Jumièges would never recover its former glory. 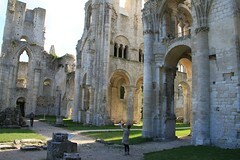 However, it was the French Revolution that finally did the abbey in. In 1793, the complex was sold off to a wood merchant. He blew up most of the central lantern tower and choir to use the rubble as quarry. The site was bought by the Lepel-Cointet family in 1852. 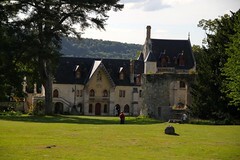 The family tried to preserve the remaining structures and finally sold the site to the French state shortly after the Second World War. The remains of the abbey still show what a glorious complex must have stood here for centuries. The Romanesque Notre Dame church was huge, as can be seen from the walls of the church that survived the destruction after the French Revolution. 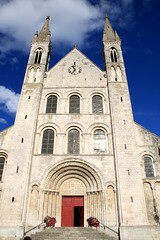 The western façade of the abbey church of Jumièges is the oldest large twin-tower Romanesque façade in Normandy. 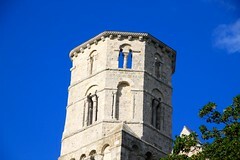 Although in an austere Norman-Romanesque style, the projecting structure between the two towers reminds of the Carolingian tradition that is more common in German Romanik than in churches in France. Much of the western façade with projecting porch and the two towers survived. The towers are 46 m (140 ft) high – it only lost their spires around 1830. A single pepper-pot turret survived on the remains of the lantern tower. The walls of the 25-m (90-ft) high and 88-m long nave are mostly intact, while the part of the lantern tower attached to the nave is still standing. Most of the central tower, transept and Gothic choir were destroyed with the stones sold off. The side aisles are still covered by rib vaulting but the roof of the nave was typically for the Romanesque with a wooden structure and thus long gone. The choir was rebuilt Gothic in 1267-70. At the same time, the transept received a Gothic makeover with the then more fashionably pointed arches superimposed on the Romanesque originals. However, most of the choir and transept was destroyed. 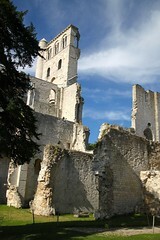 The former abbey church is the most impressive of the ruins at Jumièges but other structures of the monastery complex can also be seen. To the south of the main church are the remains of the Église St Pierre (Church of Saint Peter). Most of its ruins are 13th and 14th century Gothic but the most interesting parts are the porch and some bays of the nave that are Carolingian. 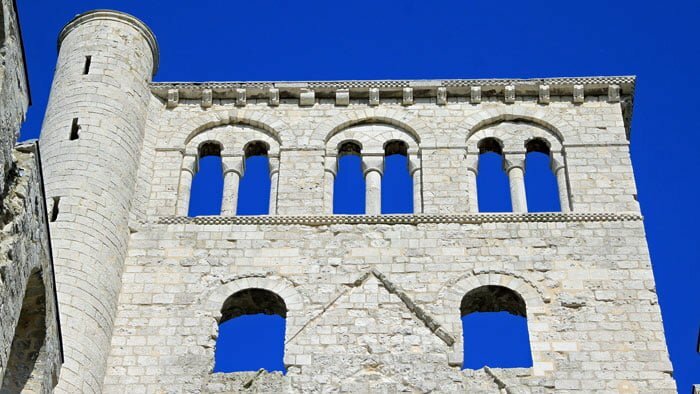 These are the only bits that remained from the Carolingian monastery that were destroyed by the Vikings. The chapter house (salle capitulaire) is from the 12th century and had some of the earliest known use of rib (ogival) vaulting. The cloisters once had 26 bays in its typical four galleries. One of the galleries was rebuilt at Highcliffe Castle in near Bournemouth in England. At the center of the cloisters is a yew tree (if), which is five centuries old. The remains of the great cellars are from the late 12th century – upper floors were added later. Visitors may also explore the large gardens – 15 ha surrounded by a 2.5-km long wall. Most of it is lawn but a formal garden, with fine views of the ruins, are to the southeast of the church. The 17th-century classical Abbot’s Lodging is not currently open to the public but will eventually house a museum. In fine weather, visitors can enjoy a game of large-pieces chess or drawers in the garden. Art works are frequently on display in the garden or in the gatehouse (porterie), which was largely rebuilt and enlarged in the nineteenth century in a Neo Gothic, Neo Renaissance style. 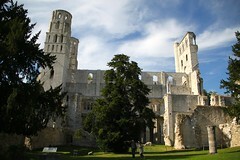 The abbey of Jumièges is often described as the most beautiful ruins in all of France. Victor Hugo described it as even more beautiful as Tournus (on the Saone River in Burgundy) while the historian Robert de Lasteyrie described it as being amongst the most admirable ruins in France. For Michelin, Jumièges is as one of the most impressive ruins in France and a well-deserved three-stars sight. The Abbaye de Jumièges is open daily from mid-September to mid-April from 9:30 am to 1 pm and 2:30 to 5:30 pm. 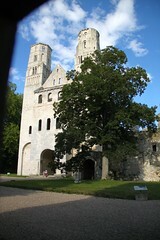 In the summer season from mid-April to mid-September, the abbey is open without lunch break from 9:30 am to 6 pm. The abbey is closed on January 1, May 1, November 1 and 11, and December 25. Admission is €6 for adults, €4 for 18-25 year olds and free for children under 18. Animals are not allowed inside the complex. Signposting at the abbey is very limited, especially once away from the main entrance. Take a free pamphlet with description and map from the ticket office. Visitors can rent an iPad with a 3D model of four sites showing with overlays how the buildings should have looked like. The app is also available for free on the Jumièges website – be sure to download all the data if planning to use the app without wifi at the ruins. It has videos, audio, photos and a game to enhance a visit to Jumièges or simply enjoy a virtual visit. Between Jumièges and Rouen is the Abbaye St Georges in the small town St Martin de Boscherville. 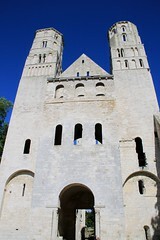 This abbey also has a large Romanesque church that shows to some extend the scale and what Jumièges must have looked like, although Jumièges was artistically much more accomplished. The art and decorations here are more crude and simplistic than were in use at Jumièges. Admission to the church is free but there is a charge for visiting the other buildings in the monastery complex. Jumièges is on the northern side of the Seine River inside a promontory of the meandering river near Rouen in Seine Maritime, Upper Normandy. 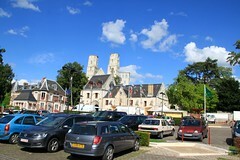 The abbey is easily reached by car – also note the free ferry services across the Seine River if arriving from the south. 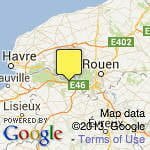 The 30 km drive to the west of Rouen should take only half an hour in light traffic on country roads or around an hour from Le Havre, Honfleur, or Etretat. Plentiful parking is available right across the road from the gatehouse. The post office building in front of the abbey was once owned by Charles Brohy, uncle of Maurice Leblanc, who often visited and included Jumièges as setting in the Arsène Lupin novel La Comtesse de Cagliostro. Seine Maritime bus 30 sometimes passes through Jumièges (and St Martin de Boscherville) with a stop right in front of the abbey but in the low season often does not pass through Jumièges itself. In such case, use stop Yainville-Centre, which is a pleasant 3 km walk from the abbey. Traveling time from Yainville to Rouen is around 40 minutes with the bus running at least hourly (two-hourly on Sunday). Yainville is also the home of a Christofle studio and factory. This famous French manufacturer of silver, silver-plated and stainless steel flatware has a factory outlet shop at Route de Duclair (tel 02 3505 9210) – open Tuesday to Saturday from 10 am to 6 pm. The shop is well signposted and on the D982 when leaving Yainville towards Duclair and Rouen. Jumièges is a great day-trip destination from Rouen – several routes are possible that include other abbeys or the magnificent views that can be enjoyed of the meandering Seine River. It is also a great stopover when en route from other destinations in Normandy such Le Havre and Etretat. 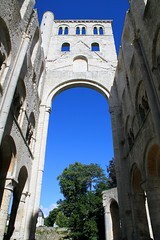 See more photos of Jumièges Abbey on Flickr.